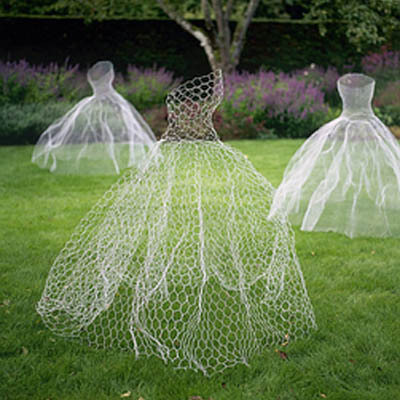 These ghosts made out of chicken wire were one of my first discoveries on Pinterest. I messed around with chicken wire for the Dancing Ghost Bride, and it was trickier than I thought it would be. They are beautiful, ethereal, and I want to make four of them at least, using real pajarigirls for the forms. I’d love to have the whole backyard filled with non-creepy dead people in foofy dresses. I also Googled chicken wire ghosts and found another post with two tutorials for making them at www.bedifferentactnormal.com. Thank you!